This trip down memory lane serves a purpose, I promise! Since that trip, I’ve only seen Melissa a handful of times, but recently she shared the big news…THAT SHE HAS A BUN IN THE OVEN! Now, there are many occasions that might inspire an urge to craft a gift, but nothing, NOTHING, compares to the basic, animalistic need to create something with hook and yarn to greet a new life into the world. Once Sammy told me the news, we planned at that moment to get together for a crochet day of epic proportions. Unfortunately, I live in Milwaukee, and Samantha lives in Madison. It took a while for my work schedule to allow me to make the hour and a half trek westward, but I finally made it. Sammy and I decided to make the Granny’s Baby Throw by Lion Brand Yarn beforehand. 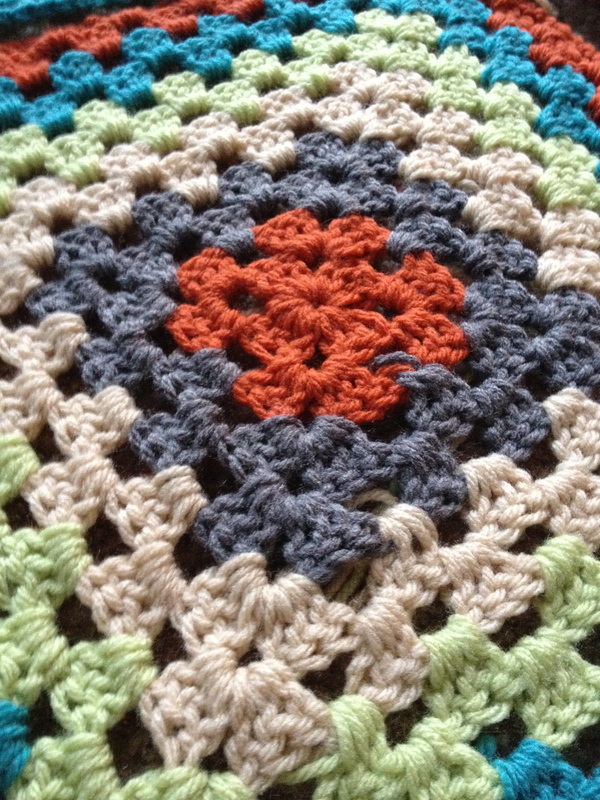 We chose the pattern because it consisted of 4 large granny squares, which we figured would work up fairly quickly, and would allow us to both work on equal amounts of the blanket. 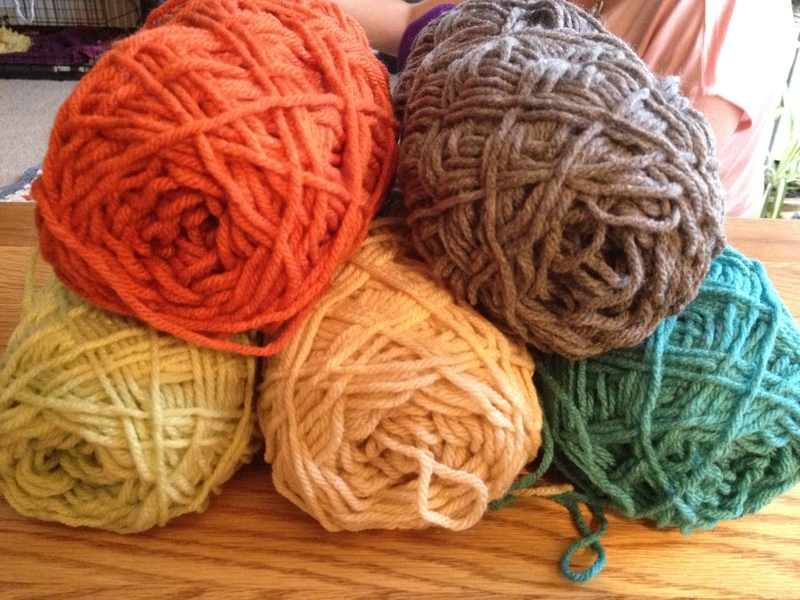 All that remained was to choose the perfect yarn combo! We bought our yarn from Michaels, and the Loops and Threads Impeccable yarn happened to be on sale for $2.50 each. The colors we purchased, from left to right, bottom to top, were: soft fern, pumpkin, heather, true gray, and aqua. We wanted a combo that was fun, whimsical, non-traditional, and suitable for a boys blanket. 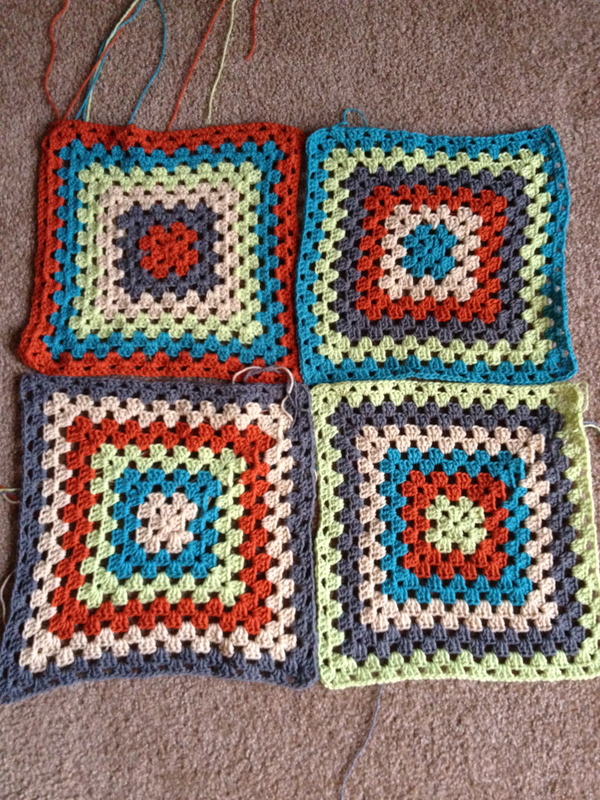 The pattern called for a J hook, but we figured we’d have to start our first squares, and stop to compare our tension and stitch sizes. I actually bumped up to a K hook, because I crochet a bit tighter than Sammy, and she made a conscious effort to work slightly tighter than she usually does. 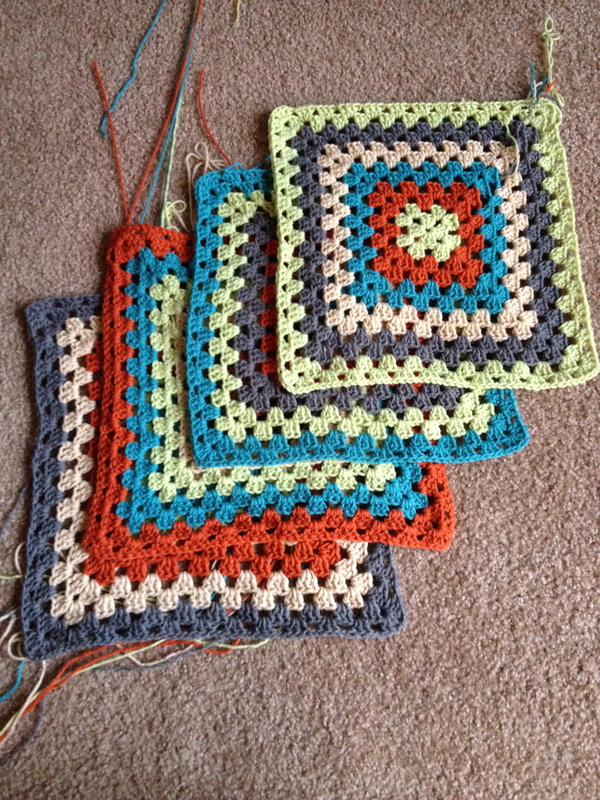 The squares turned out AMAZINGLY, and they were all almost exactly the same size. We were a little amazed at how nice the squares turned out. With each of us working at a fairly brisk pace, we finished all 4 squares in about 5 hours. An entire baby blanket in an afternoon? Yes please! Sadly, I had to leave once the squares were done, which left Sammy to weave in the ends (sorry best fwend!! ), and join the squares using an invisible join. She is also planning on adding an edge to the perimeter of the blanket. Overall, we were very happy with the pattern, the colors, and the finished product! We got to spend the afternoon together, and chatted the day happily away. 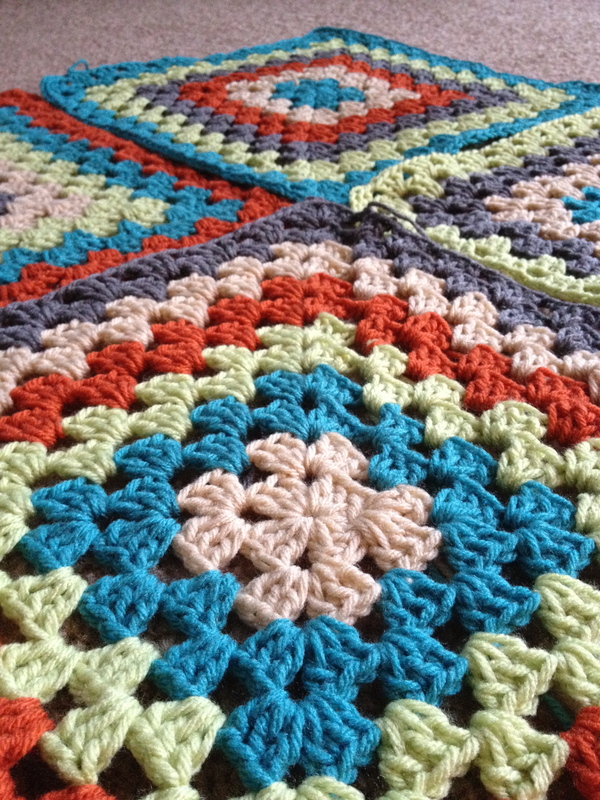 I would definitely like to make a blanket like this again, and I’m sure it probably won’t be our last tag-team project!